Here we are in Bath, a World Heritage Site. Bath is famous for its hot springs, Roman baths and stately Georgian architecture. The hot water in the spring rises at a rate of 1,170,000 litres each day at 46°C. It bubbles up into the King's Bath which was built in the 12th century AD. 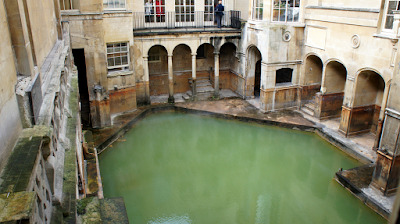 The pool of the Great Bath, heated by the ancient Sacred Spring. The spring and the temple complex were dedicated to the goddess Minerva. The Celtic people were well aware of the curative powers of the hot springs. In 863BC Prince Bladud supposedly took a dip and had his leprosy cured. He is said to have dedicated the area to the Goddess Minerva. The Romans arrived in Britain in AD43. 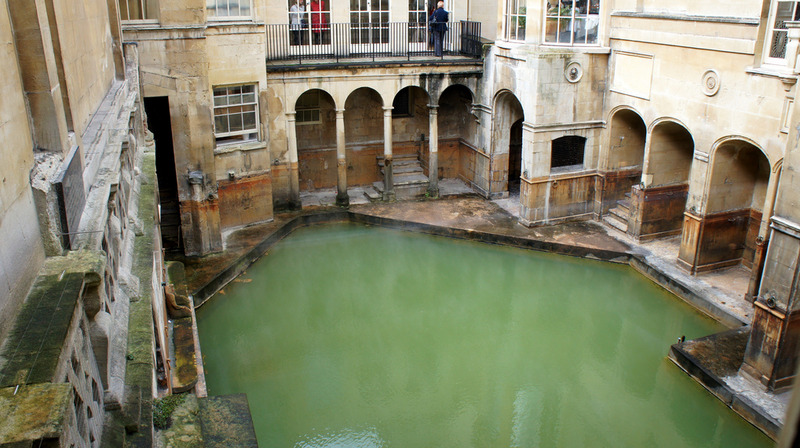 They discovered the wonderful thermal springs and established the town of Aquae Sulis, meaning 'Waters of Minerva'. They developed the baths as a scaled down version of the great baths back home. The original plan included heated rooms, steam rooms, baths, swimming pools, a gymnasium, playing field and social rooms for eating and drinking. Around the site was the Temple of Sulis Minerva. The temple was believed to bring good fortune to those who bathed there. What a wonderful tour this was sweetie and thanks so much for lettin' me tag along and get off the Ponderosa for awhile. Oh, so fun! Makes me want to jump on a plane and go to England (and be 15 years younger like I was the last time I went ;)). That's such a huge place to bathe. I wonder if they were self conscious about their bodies or didn't pay it any attention. well, don't the boys look happy here?! :) Great photo, V! The domed ceiling at the baths is so beautiful!!! (so, did you want to jump in or what?! ;)) Sounds like the Great Bath was the place to be -- perfect temperature, food, massage, separate genders! The outside of the bath abbey is so beautiful too! And is it me or are the boys towering over you?! Is that what I have to look forward to?! How gorgeous! I'm so envious of you and the beautiful views you're seeing! I am a new follower from About A Mom. Such a great time you must of had!!! Great photos! I am totally loving all these pictures... thanks for the tour!!! !